Because we’ve just celebrated Fire Prevention Week (October 7-13) firefighters were are on my mind more than usual. Firefighters are always on my mind! I come from a family filled with firefighters: both men and women, past and present, volunteer and paid. That’s one reason why I was so determined to tell the story of Molly Williams, the first female firefighter in America. My book, published in 2012, can be used as a jumping-off place to discuss all the other community heroes living and working in our own towns: police officers, EMTs and ambulance drivers, trash collectors, nurses, doctors, veterinarians, food bank volunteers, animal rescue workers, and so on. Which is just how it is used in this creative writing exercise aimed at students in grades 1-3. 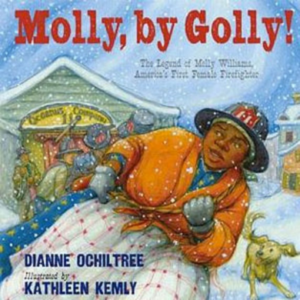 Besides a copy of Molly by Golly! The Legend of Molly Williams, the First Female Firefighter in America, the only supplies you’ll need are copier paper, stapler, pencils, erasers, crayons, markers and blackboard/erasable white board/large pad of newsprint paper for recording/displaying group brainstorming results. 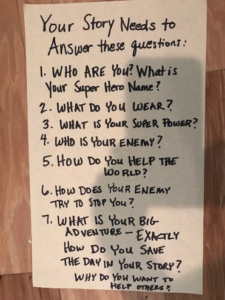 You can use the “What’s Your Super Power?” fill-in-the-blank form if you wish (download 1). You might also want to purchase pre-made blank books from a craft store supplier instead of folding and stapling sheets of copier paper to make inexpensive, dummy-like books for the kids to write and draw in. Once your supplies are gathered, you’re good to go! 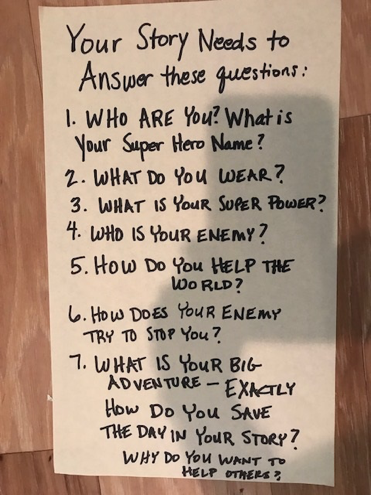 Ask kids: what do you think is YOUR super power? If you could be a comic book super hero character based on your real-life super power, who would you be? 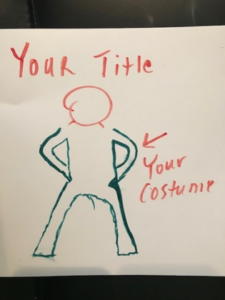 What costume would you wear? Who would you help? How would you help them? 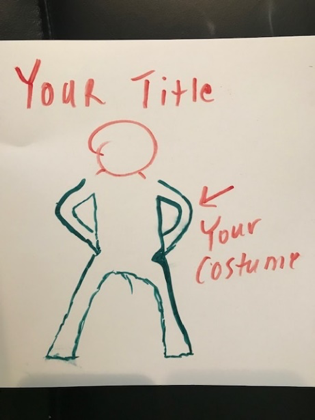 Encourage them to think of plenty of details about the when, what, where and how of their super power activities so they will have plenty of good ideas for a picture all about super hero selves. 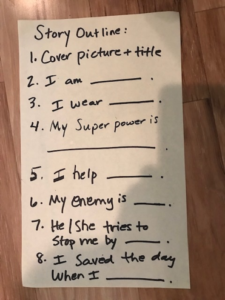 To get them started, you can either list the story-starter questions named below on the blackboard/white board/newsprint sheet for kids to write out on scrap paper or use the downloaded WHAT’S YOUR SUPER POWER? handout for their answers. Here are the story-starters: What is your real-life name? What is your super hero name? What are some of my super powers? What is my biggest super power? Who do I help? How do I help them? What kind of super hero costume do I wear to work? My arch enemy is who? What was my most daring deed? How did I save the day? The purpose is to generate a few meaningful details with which the students can start writing their stories. Now the writing can begin. Let them do a first draft on scrap paper. Review this version with each student before moving on to the final words and pictures stage. Pencils are good for the printing-out of text on the blank books as it allows for last-minute changes. Having kids work with the points posed on the ‘Your Story Needs to Answer These Questions’ and the ‘Story Outline’ illustrated in the photos below help kids understand what a story is and what a story does as they begin to create their own adventures. I do the ‘super hero’ brainstorming and creative work with kids in 2 sessions of about forty-five minutes each. The first day is dedicated to reading the story about Molly Williams, discussing everyday heroes in our own community, and brainstorming possible super powers for the kids to base their own super power picture book on, starring them as a community helper super hero—including answering those questions. The second day is devoted to review of concepts, final decisions and the actual writing/illustrating of the book. I limit the book size to 4 sheets of copier paper folded once, which gives kids 16 pages for the front/back cover pages plus the story text. I circulated around the room as kids wrote and made artwork, helping them to keep it simple, and still keep it a story. Crayons and markers work well for illustrating the text in the kids’ books. The point is to have fun while learning the basics of storytelling. The finished “What’s Your Super Power?” creations can be displayed in a school showcase or on a special shelf space in the classroom as a group statement of the many super powers the kids already have to give the world. In one school, the kids and teacher used a roll of craft paper to do a life-sized body tracing of each student, which was then fully-illustrated to show their super hero selves from head to toe. These were displayed on the school’s hallway walls. One teacher arranged for her students to read their completed books aloud to the school’s kindergarteners. Another had parents in for a special reading. If you have any images of the creations made by your class that you’d like to share here, please do.